This is an extensive biography and list of facts on Dr. Booker T. Washington. 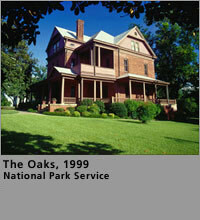 The Oaks was Washington's command center and Tuskegee Institute's social center. The Oaks, Washington's home, provided tangible evidence of his success. It was a place of employment and an on-the-job training site for students. African-American educators, businessmen, and farmers were entertained there. Professional staff visited frequently. This is a link to the text for the autobiographical book by Dr. Booker T. Washington, "UP FROM SLAVERY". "Tuskegee and It's People: Their Ideals and Achievements", is a book edited by Dr. Booker T. Washington. This link gives access to the complete manuscript. Equipping Young Americans to Live, Learn and Lead. This is a short version of Booker T. Washington's biography by the Public Broadcasting System.